GoViral Social integrates Facebook, Twitter, and e-mail with your app. Tap the power of the Facebook graph, invite friends to your app, authenticate your users with Facebook Single Sign-On, post message and images to the user’s wall. The entire Facebook API is at your fingertips through a simple interface. You can also Tweet any information or e-mail something with image attachments. Send Facebook invitations- recipients are directed straight back to your app, or the App Store! 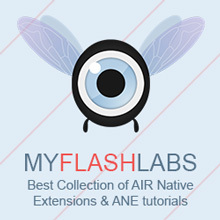 Air Native Extension, Android, iOS Commercial. URL.